Grain crops that produce less carotene can produce more food, especially in Africa, as they are less affected by parasitic plants. This is the result of research with which Muhammad Jamil hopes to obtain his doctorate at Wageningen University on 11 January 2012. Jamil studied processes and technologies that could improve the control of the parasitic weed Striga both in the lab and in the field. He discovered that rice plants that produce less carotene than usual are less infected by the Striga parasite. Jamil believes that his findings could lead the way to cheaper and effective technologies for improving food production and farmer incomes, especially in Africa. Parasitic plants in cereals such as maize, sorghum, highland rice and millet are increasing the pressure on food production in Africa. One of the main problems is Striga, a deceptively beautiful plant that takes all the water and nutrients it needs from its host. The parasitic plant mainly attacks cereals when the growing conditions are unfavourable, which is why particularly cereals in Africa are affected. 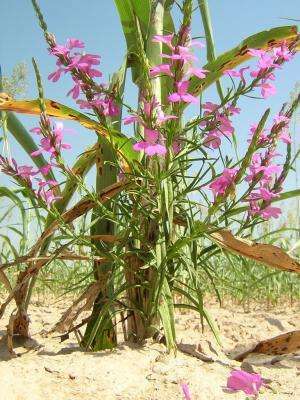 The effects are disastrous as Striga can cause complete harvest failure. Originally from Pakistan, Muhammad Jamil studied at Wageningen University the processes involved in the germination of Striga seeds and their initial attachment to the host. Prior research had already shown that Striga seeds only germinate when specific plant hormones  called strigolactones  are present in the soil. Strigolactones are secreted into the soil from the roots of the host. This signals the Striga seeds that there is a host root nearby that can be infected, causing the seeds to germinate and the seedlings to attack the crop. Jamil studied various approaches for reducing the damage caused by Striga, including the effect of substances that reduce the production of strigolactones, the genetic variation for the production of strigolactones, and the effect of fertilisers on strigolactone production. He studied the consequences on the germination of Striga seeds and the attachment of the seedlings to rice, sorghum and maize. Plants produce strigolactones from carotene, the well-known colouring agent also present in carrots. Jamil treated rice with very low amounts of compounds that inhibit the production of carotene. By doing so he succeeded in reducing the strigolactone production of the plants. And the effect was considerable: The germination of Striga seeds was reduced by up to 75 percent. The use of fertiliser also resulted in a substantial reduction in strigolactone production and, therefore, Striga infestation. In addition, Jamils research showed that the strigolactone production of different rice varieties varies tremendously. Some varieties have a low strigolactone production and are therefore less affected by parasitic plants. All in all Jamil sees good opportunities for developing cheaper, effective technologies to reduce the effect of the Striga parasite. This would allow African farmers to produce more food and achieve a better income. My understanding is that beta-carotene is an important human nutrient. I am surprised this wasn't brought up in this summary article, but it could be in the full article. If so, this summary was poorly written. If not, well, it certainly needs to be taken into consideration.